Staff members of Draeger-Langendorf Funeral Home & Crematory are caring and experienced professionals who understand that each family is unique and has personal requests and traditions. These requests and traditions are of utmost importance to our staff of licensed funeral directors. Gary started his career in funeral service in 1967 with Hansen Funeral Home of Kenosha. In 1972, he moved his family to Racine to work for Jerome Draeger. Gary became a partner with Draeger-Langendorf Funeral Home in 1977. In 1991 he purchased the funeral home and became the sole proprietor. His second son, Michael came to work with his father in 1991 and his eldest son, Brian joined the funeral home in 1993 and Mark in 2010. Gary has served as both a former board member and past officer, including president of the Wisconsin Funeral Directors Association. He has also worked as a liaison with the National Funeral Directors Association and currently with the State of Wisconsin Cremation Board. Gary has been married to his wife of 50 years, Mary Sue. Together they have three sons and their wives, Brian, Michael and Leigh Ann and Mark and Alison. They also have four grandchildren; Mallory, Lucy, Andrew and Adam. Brian has lived in Racine for most of his life. He graduated from Park High School in 1987, UW Madison in 1991 and Worhsam College of Mortuary Science of Chicago in 1995. 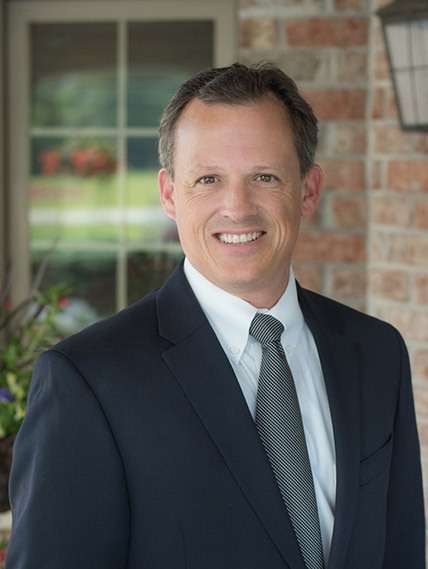 Brian joined the family business in 1993 and became a licensed funeral director in 1995. He lives in downtown Racine with his sons, Andrew and Adam. Mark was born and raised in Racine. He graduated from Park High School in June 1992. He attended University of Wisconsin – Madison where he received his Bachelor’s degree in Bacteriology in May 1997. In April 2008, Mark received his Master’s degree in Computer Information Systems from the University of Phoenix. Mark was employed as a Senior Systems Analyst with Abbott Laboratories Diagnostics Division for 13 years until he resigned to join the family firm in March of 2010. Mark received his Associate’s degree in Funeral Service from MATC in August 2011 and became a licensed funeral director in October 2011. Mark lives with his wife, Alison, in Trevor, WI, on the east side of Camp Lake. Ashley, born and raised in Racine, is a 2001 graduate of Walden High School. She began working at Draeger-Langendorf in 2008 and began to pursue her career in funeral service, graduating from MATC in 2011. She is a funeral director working as an embalmer and she enjoys cosmetizing. She lives with her fiancé, David, their two sons, Dane and Gage and daughter, Vada. Leslie has been a resident of Racine all of her life. She graduated from Park High School in 1989 along with Michael Langendorf. After high school she attended the University of Wisconsin-Whitewater and Carthage College. After college she was employed by Coca Cola Enterprises in the Accounting/Audit Department. As a result of corporate “downsizing”, she was able to go back to school full time to fulfill her lifelong dream of becoming a Funeral Director/Embalmer. Leslie served her apprentice and internship at Northwest Funeral Chapel in Milwaukee, WI. She graduated with a degree in Mortuary Science from MATC in 2008. In 2012 Leslie joined the Draeger-Langendorf Family and became our First African – American Licensed Funeral Director/Embalmer. She is currently licensed in Wisconsin and Illinois. Leslie is married to Pastor Kendrick Scales and is the mother of five beautiful daughters, as well as the grandmother of one adorable granddaughter and two handsome grandsons. Paul Schaefer, Adam Chalekian, Robert Fonk, Jeff Hanson, George Wanggaard, Patricia Bonn, Ricky Moore, Kathy Anderson, Felicia Boyd, Bruce Koellner, Betty Goodwin, Jerry Smith, Tony Burchyett, Krisse Therkelson, Julaine Rosinski, George Oliver, Dave Huck, John Halberstadt, Craig Welch, Phil Anderson, John Vankoningsveld, Andrew Langendorf, Adam Langendorf, Leigh Ann Langendorf, Mark Schaefer, Tom Canfield, Jeff Gister, Chris Fannin, Kathi Wilson, Bobbrette Moore, Carrie Massey, Eric Antrim, Angela Binder. Thank You, is not enough! Amazing Grace! How Sweet and Professional, with Great Outstanding and Excellent Service, the Entire Staff here at Draeger-Langendorf Funeral Home are. Receiving, Great customer service every minute of handling business and comforting you and your Family during this Hard time. Never a minute of worry, never a minute of Loneliness during the time of planning, For your Love one while Final transition is being prepared. Mrs. Lesley is Truly and GOD sent Angel, every step of the way, Mrs. Lesley always willing to give, you the moment!! With “Great Poise” and comfort to my Family and I, (when my days were so cloudy) Mrs. Lesley answered every question and help to make a clear decision for My entire Family in the time of My Sister’s preparation. The Entire Draeger-Langendorf. Staff are Truly an Extraordinary Family to All that arrive at their home.